Embedding your survey gives you the option of embedding feedback surveys in website or products. Embedded surveys provide insightful data such as usability, user impressions, and how effective the user found your website. You can also use embeds to collect leads from your website. Embed option in SurveySparrow supports three types of data collection. This surveys will trigger proactively to the users when set conditions are met. You can control triggering options like the time after loading, the portion of website that has been scrolled through, or the presence of matching string URL pattern. This type of survey is when users can invoke a survey by clicking on a button present in the web page. You can use this feedback button option to collect data reactively. The users who wishes to provide feedback can click on this button and proceed with the survey. You can use this option to embed a complete survey to your page. You can control the width and height of the window as well as the window styling. This type of survey is ideal to collect short and crisp feedback. From the Share options, select Embed to create an embed share. Click on New Share. Rename the Embed Share in the upper-left side of the page so it is easily recognizable. From the three modes available (Auto triggered, User Invoked, and Inline Embed), choose the widget type you prefer. Customize the widget by configuring colors, position, sample rate and triggering options. Below the configuration options, the code snippet appears. Copy the code snippet by clicking on the Copy button. Select Save & Exit in the upper-right corner. 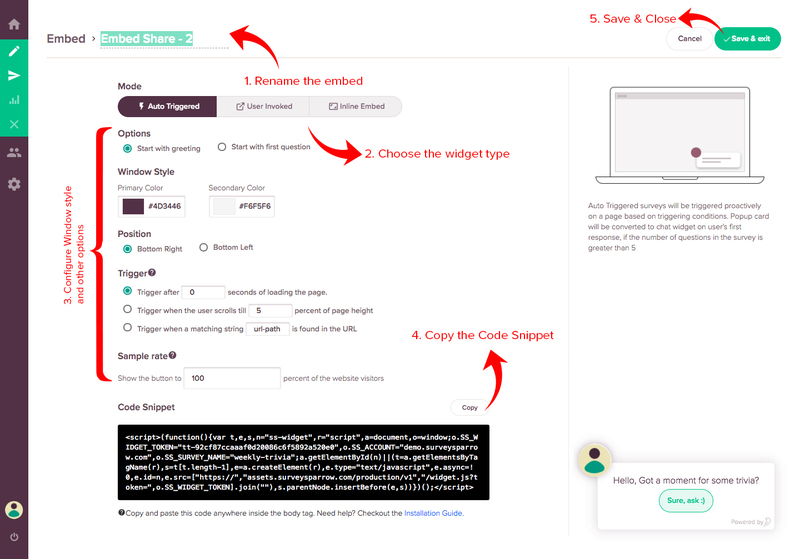 Now that you have copied the desired code snippet, paste the code anywhere between the <body></body> tag of your html code to register the survey widget. You have successfully registered the chat widget which is now ready to use! Note: Any changes you make to the configuration or mode will reflect automatically in your webpage without needing to change the code.